Stress is a fact of life in the world around us. Deadlines, places to go, things to do, people to see, and always in a hurry to get everything done. All of this adds up to stress… and the harmful effects of stress. Regardless of its source, stress leads to significant problems in physical health, mental health, and relationships. Your body is designed to handle stress – up to a point. The difficulty today is the stress you experience is usually unrelenting. This is the kind of stress that brings on harmful effects. One of the first effects of stress on your body is muscle tension. The tensing of your muscles is almost an automatic reaction to any kind of stress. Chronic stress leads to a constant state of tension. This can then lead to tension headaches, migraines, continuing body and muscle aches, worsening of arthritis pain, and possibly to a state of chronic pain. Under stress, your heart will beat faster and work harder. This can lead to high blood pressure. Research has shown over and over again there is a connection between stress and heart problems. Heart disease, strokes, and hypertension are all potential harmful effects of stress. When you’re under stress, the smooth muscles of your arteries constrict, raising the pressure of the blood through them. Your risk of heart attack or stroke increases the longer your blood pressure remains high. Click here to learn more about heart and circulation problems. When you experience stress over a long enough period of time, there are several harmful effects of stress on your stomach and GI system. One thing that may happen is you either eat a lot more than usual or you stop eating. Heartburn and acid reflux may begin or increase in severity. Over the short term, you will likely experience feelings of nausea and even vomiting. Over longer periods of time under stress, you’ll possibly develop ulcers in your stomach. Even without ulcers, you can have significant stomach pain. Your digestion will also be affected. Many of the hormones released when you’re under stress will cause stomach problems. Unrelenting stress many times also results in emotional effects. Often, these emotional effects of stress come as a result of the many other harmful effects of stress adding up on your system. Depression and anxiety are the most frequently encountered of these effects, but many others can also result. One of the other emotional consequences of continuing stress is one of several forms of body focused repetitive behaviors. These are better known as trichotillomania, or hair pulling and skin picking, or plucking eyebrows and lashes. Take a look at the skinpick website for more on this topic. One of the major harmful effects of stress is on your endocrine system. Under stress, your adrenal glands, located just above each kidney, are called on to secrete several hormones to help your body deal with the stress. One of the most important of these hormones is cortisol. When stress continues without letup, your adrenals become fatigued and unable to continue secreting cortisol. This leads to a cascade of many significant physical issues that can become debilitating over time. Another aspect of your endocrine system that is affected by stress is your liver. When cortisol is released, it has a significant effect on your blood sugar. One of these effects is for your liver to produce more glucose, raising the level of your blood sugar. If this continues long enough, you are at risk for developing Type 2 diabetes. Both male and female reproductive systems suffer from the harmful effects of stress. Continuing stress and the continuing effects of cortisol can lead to decreased testosterone levels, lowered sperm count, and impotence. For women, menstrual problems such as painful and irregular periods, PMS, and a decrease in sexual desire. Although there are these harmful effects of stress, and others, there are also many ways available to you to treat your stress and rid yourself of these effects. Learning to relax physically and mentally are two very good ways to begin dealing appropriately with your stress. There are many well-trained professionals available to help you deal with these effects as well. Wayne Winkle, Ed.D., ABPP, is a psychologist with 40+ years of experience. He has worked with adults, children, families, and groups in various therapeutic settings. <= Previous Posts Scared of Driving? 7 Tips That Can Help! 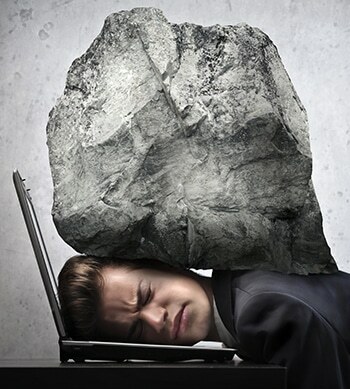 Stress is a huge contributer to pain and muscle tension. It plays a large role in everything we do as physical therapists.